Sandy is an environmental economist with a particular interest in the motivations and trade-offs associated with greater material efficiency and demand reduction. 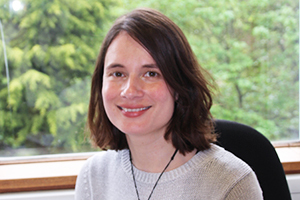 She is a Research Associate on the Whole System Energy Modelling (wholeSEM) project exploring the welfare implications of reducing demand, and improving the characterisation of demand in whole system energy models. Sandy holds the Charles and Katherine Darwin Research Fellowship at Darwin College and was awarded a wholeSEM bilateral fellowship to collaborate with the GEM-E3 macroeconomic model. Sandy’s PhD focused on the incentives for greater material efficiency in the use of steel. The work was funded by the WellMet2050 project under the supervision of Prof Julian Allwood, University of Cambridge. Sandy has an undergraduate degree in Economics from the University of Cambridge and an MSc in Metals and Energy Finance from the Imperial College Business School. Between degrees, Sandy worked for the policy research consultancy Brook Lyndhurst, advising the public sector on pro-environmental behaviour change policy. During the three years she spent there, she worked on a variety of environmental issues, first as a researcher and later as a project manager. Sandy publishes under her full name Alexandra C. H. Skelton.